You might think these boots are what is left of a Robert E. Lee monument, but they are not. 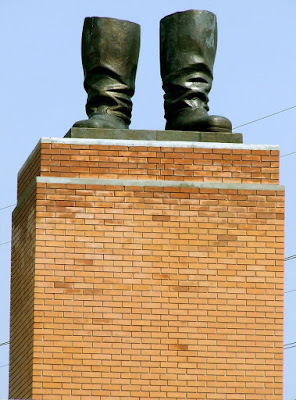 They are the boots of Stalin and are a replica of part of a statue of him once erected in a place of honor in Hungary. The boots now stand quietly in Memento Park along with other no-longer-sung heroes of the communist era. The boots honor those who fell in the 1956 uprising, without the need to honor the evils of the communist regime. Memento Park, like others across the world hold many statues that no longer honor leaders, but now simply serve as reminders of what we should not forget. Perhaps in the US we can learn this lesson. We can move these monuments, or perhaps repurpose them. The problem with civil war monuments is that they are not simply statutes of sinners, but that they were erected to honor those who fought to maintain the sin of slavery. They are not monuments to bravery, loss, patriotism, or sacrifice. They are, simply and truthfully, monuments to sin. Last year my husband and I traveled with good friends to Europe. We spent time in Berlin and within a two-day period we saw Checkpoint Charlie, remnants of the wall, and memorials to the millions who were killed in concentration camps. These are monuments that remind us of grief, but do not honor sin. They seemed to be a type of repentance. They do not atone for the horrors perpetrated. Instead, they honor the victims and remind us of the pain that sin caused. One reason for the controversy with our civil war monuments is that we, as a country, have never repented of our sin. We have barely even acknowledged the evil of slavery, much less atone for it. We want to move on. We want to forget. But forgetting cannot come before repentance and forgiveness. When we change the order we end up creating monuments to our sins. Trying to forget an unadmitted sin only perpetuates the sin. I would think that surely segregation, lynching, and redlining show us that. To this day we merely treat the consequences of this sin without addressing the real problems. I know I find this true in my own life. When I do not admit to a sin the sin does not become less memorable. Instead I dig in my heels and erect a monument to it. I comfort myself that the sin wasn’t really so bad. When that doesn’t work I convince myself that the victim deserved my actions. Sometimes I even rewrite the story so that I am the victim. When sin is not addressed with repentance and forgiveness I might as well erect a monument to it. And then you can bet I will fight to keep that monument as it will become sacred to me. It has become the only way for me to accept the pain and grief of my sin. As David reminds us in Psalm 32, when we do not admit to our sins they are heavy upon us, sapping us of our strength. Our sins not only continue to impact our victims, they impact our own life and faith. It is as if the monument to our sin stands on top of us, crushing our spirit. We are blessed to be forgiven. We are blessed to have our sins covered and no longer held against us. In this Psalm God reminds us that finding refuge in Him is as much about finding refuge from our own sin as it is finding refuge from a storm. Do you see in the last verse how sorrow is separated by steadfast love, trust, gladness, and rejoicing? When our sins are covered and we find our joyful hiding place in God we can then, through the power of the Spirit, move on to instruction. In this way the grief of repentance turns into the relief of forgiveness which then becomes the joy of a restored relationship, with God and with each other.